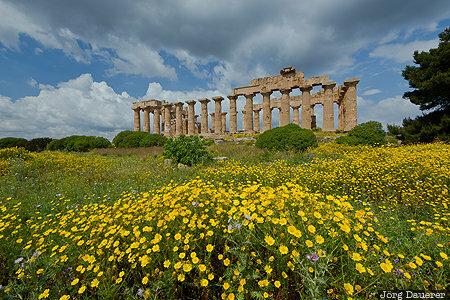 The Temple of Hera in the archaeological site of the ancient Greek city of Selinunte in a sea of yellow flowers. Selinunte is in the south west of the Mediterranean island of Sicily, Italy. This photo was taken at around noon on a sunny day in April of 2017. This photo is part of the exhibition The color Yellow (June 2013). This photo is in the Photo Calendar "Sizilien". This photo was taken with a digital camera.